Nothing compares to the soft feel of Cherrywood. Our base fabric is a high-quality unbleached muslin. Multiple washings in the dyeing process result in a very high thread count. Our unique colors have been described as muted, brushed, broken-in, subtle, comfortable, earthy and rich. There are many commercial solid fabrics on the market today, but none will ever be able to duplicate the richness of Cherrywood. Your projects will stand out much more when your solid color has depth and texture. More focus is given to design lines when the eye is not distraction by pattern. Let us do the color work for you. We have already labored over hue, value, saturation, shade, tint... all those color theory terms that send some people running. No matter how you use our gradations, they look fabulous. Cherrywood Fabrics was created about 32 years ago by Dawn Hall, who started dyeing fabric in her basement and selling at quilt shows with her aunt. With the help of dedicated friends and employees the popularity of this unique fabric has grown and changed over the years. Cherrywood has gained a reputation for high-quality, scrumptious colors, and personalized customer service. We now have a dedicated studio, a storefront, six workers and distribution all over the world. In 2002, we lost Dawn to cancer. But with her high standards instilled in us, we continue her legacy — bringing wonderful color and inspiration to our creative customers. Today, when you call the Cherrywood studio, you will be greeted by Karla Overland, Linda McQuaid or Donna Anderson. Karla is the Colorist, Dyer, Designer and Owner of Cherrywood. Linda is the Sales Rep. and handles all retail and wholesale sales. Donna is our Special Exhibits Coordinator and Administrative Assistant. We work with four home-based workers who iron, fold, cut and package the fabric. Arlo Hill, Darla Grotzke, Lorrene Maroney, and Betty Jo Franzen are the ladies who make those bundles look so enticing. We also have sewers and designers who help make all the beautiful samples seen in our booth and website. Our days are filled with receiving and processing orders, preparing for national quilt shows, and hand-dyeing over a thousand yards of fabric a week. We love to meet our customers at the quilt shows that we vend at all over the country. We send literally tons of fabric to each show and exhibit many wonderful examples of quilts and clothing in our booths. 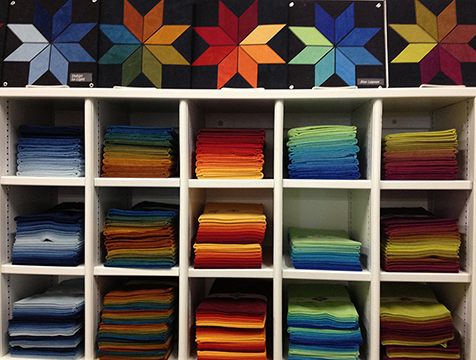 Our sales associates (affectionately called “show girls”) are eager to answer your questions and to assist in making color and pattern selections at the quilt shows.